One of the less realized impacts of Chris’ crazy schedule back in Wyoming was that we had moved away from cooking and eating big breakfasts together as a family. Since we never had dinner together on Nantucket, we had developed a giant family breakfast tradition every morning before we walked him to work. That tradition got lost in Gillette and, alone, I pretty much never made much more than oatmeal for breakfast every morning. Now that we get to eat meals together, we are reviving our big breakfasts on weekend mornings, which is a great excuse to play around with new recipes. Chocolate waffles were Chris’ idea yesterday, and as soon as I heard that, I was in the kitchen and on it. 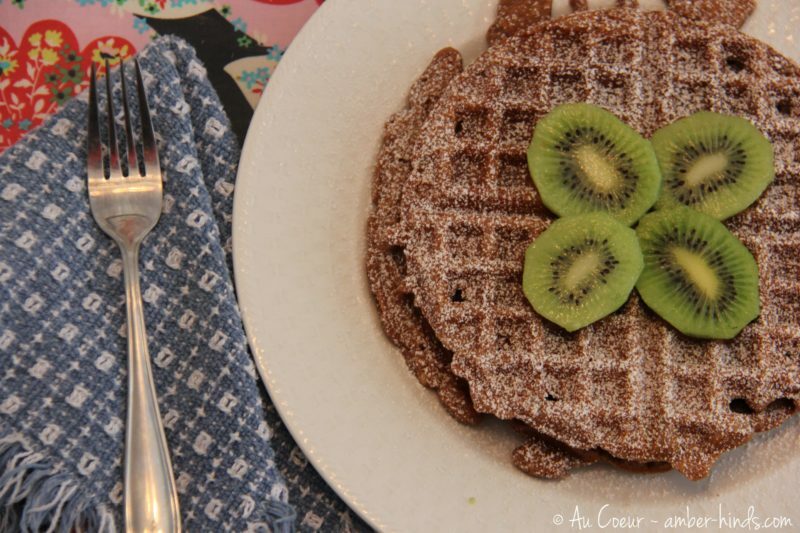 This recipe is an adaption from my standard waffle recipe, though a little sweeter. It turned out to be a fabulous backdrop for the grown in the US kiwis we found at the grocery store last week. I didn’t have any chocolate chips on hand when I made it, but I couldn’t help thinking that a handful of dark chocolate chips thrown in the batter would have really made these divine. Chocolate chips or not, this recipe is a keeper. In a medium bowl stir together flour, cocoa powder, sugar, baking powder, and salt. Make a well in center of flour mixture; set aside. In another medium bowl beat eggs slightly; stir in milk, butter, and vanilla. Add egg mixture all at once to flour mixture. Stir just until moistened (batter should be slightly lumpy). 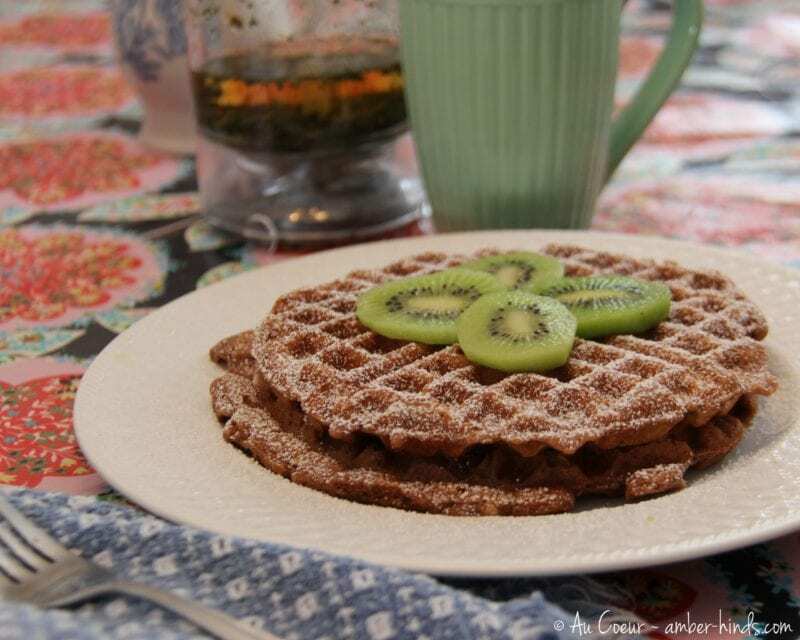 Pour batter onto grids of a preheated waffle maker (use a regular or Belgian waffle baker). Close lid quickly; do not open until done. Bake according to manufacturers directions. When done, use a fork to lift waffle off grid. Repeat with remaining batter. Serve warm. Garnish with powdered sugar and fresh fruit as desired. Makes 9 6 inch waffles.